Walt Disney's Biography - Part 10 – Disneyland! Home/Walt Disney/Walt Disney’s Biography – Part 10 – Disneyland! Several days before Disneyland opened, Walt and Lilly celebrated their 35th anniversary at the park. It was a happy night for the family, complete with Walt and Lilly dancing on the stage of the Golden Horseshoe. Diane recalls her father in the backseat of the car on the way home, holding a rolled-up Disneyland map: “He was tooting through it like a little boy with a toy trumpet. And then he was singing a song. And before I knew it, there he was like a little boy, sound asleep, with his trumpet folded in his arms.” Opening day of the park was televised on a 90-minute live television program that was the most-watched TV event up to that time. Some 20 cameras posted around the park telecast a vision of exciting attractions, heartfelt dedications, and relaxed commentary from Art Linkletter, Bob Cummings, and Ronald Reagan. But like so much on television, reality didn’t quite live up to the illusion. In fact, the park wasn’t really ready for prime time yet. Opening day, rides broke down; there were too few trash cans; lines were far too long; not enough water fountains were operating. Perhaps worst, thousands of counterfeit invitations had been distributed, and so the park was overloaded, while the roads leading to Disneyland were jammed with bumper-to-bumper cars filled with irate passengers. But opening day was soon over, and most of the problems were fixed. Better yet, Walt was able to start making changes and improvements. Dumbo Flying Elephants, 20,000 Leagues Under the Sea, and the Mike Fink Keel Boats were all in operation before the end of the year. Tom Sawyer Island opened the next. 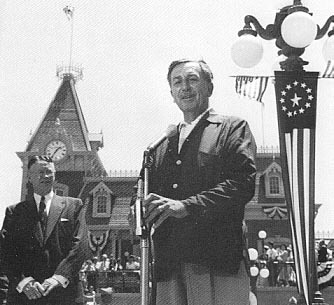 “Disneyland will never be completed,” Walt said. “He practically lived there,” recalled Lilly. Considering his commitment to Disneyland, it’s not surprising that Walt was unable to devote himself to the studio’s film output as he had in the past. Though quality was somewhat erratic — more than one less-than-wonderful film was released — the studio produced a series of successful films through the early 1960s. The animated features included “Lady and the Tramp,” “Sleeping Beauty,” “101 Dalmatians,” and “The Sword in the Stone.” Live-action films included “Johnny Tremain” (which featured Sharon in a bit part), “Old Yeller,” “Darby O’Gill and the Little People,” “Swiss Family Robinson,” and “Pollyanna.” Walt was always involved with casting, and for Pollyanna he hired 12-year-old Hayley Mills, a very talented young lady who went on to star in a number of Disney productions. “She would mess with her mouth and be very natural. Walt loved her,” reported artist Peter Ellenshaw.